Welcome to my blog! I'm here with a card for the latest challenge at Freshly Made Sketches, where our hostess this week is Linda Callahan. I'm also playing along with the MFT Color Challenge. Check out Linda's sketch! I was influenced by Linda's own card when I sat down to make my card. While it's hard to see in the photo, I created a scene with the diamond shape, fading out the colors towards the edges. I then stamped, colored and die-cut the sweet little girl image and adhered her with foam tape to the sponged and die-cut panel. I added a sentiment and then glued that down to a white card base. Finally, I finished the card by adding a yellow Nuvo Jewel Drop to the flower on her hat. Thanks for visiting! Head on over and check out what the rest of the DT have done with this fun sketch. Edited to add: Thanks to Barb for reminding me this fit with the challenge at Addicted to CAS. I never gave a thought to the fact it had "luck" in the sentiment! Subtle, and perfect ... what a darling little traveler she is! She's beautiful, Karren! I love the way you used those colors in a way that made the orange predominant. The way you designed the background sure reflects that diamond shape on the sketch - so clever! Oh you do have a way with color! This little gal is adorable and oh so perfectly colored! Love the soft inky glow behind her! Thanks for making my sketch oh so sweet! Super CUTE take on the sketch, Karren! Beautiful ink blending on your background and I love those reddish-brown Copics that you used for her suitcase (I'm adding them to my wishlist)! 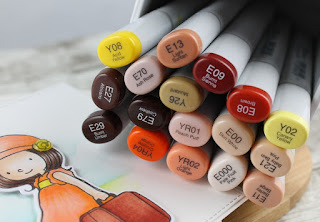 I love how you've used the diamond element in the sketch -- you are a master at blending ink. And this little girl is the sweetest, and beautifully colored. Oh I love it! The shading you've given your background is flawless and the image you've used is as sweet as can be! Yep...I'm glad Barb told you about the code word...your card fits it perfectly! 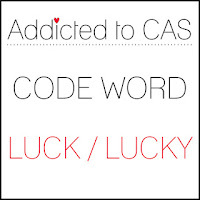 Thanks for joining us at Addicted to CAS. This is such a beautiful card Karren! I love this little girl and your amazing colouring! So fun! Beautiful! I love the softly blended scene in the background! I can see that diamond! What an adorable card. And dare I say it, that this gal looks a tad like Miss Emma! I've not seen that MFT set Karren - it's such a sweet image and totally fits the sketch. I'd never have thought of using a figure like that...I used it completely literally this week! She is so awesome! Oh, your shading make me envious (yet again). What a great card!